It’s almost a countdown, ensuring that this “body of work” called Kitchen Parade includes my family’s oldest and most treasured recipes. This is one. I remember my Canadian mother and grandmother and aunts making potato blintzes, pillows of soft and creamy mashed potatoes wrapped in crepes, served steaming hot, always-always with dollops of sour cream on the side. And now I make them too! Last month when we were heading to Texas to visit my sister before Thanksgiving, there were leftover mashed potatoes in the fridge so an hour before our departure, I quick-quick made blintzes to carry along! They’re that easy! Usually though, blintzes are “holiday” food, at Christmas for brunch or breakfast and at Easter with ham, saved for special occasions. When does Christmas begin, really? This isn’t a calendar question but the consideration of the moment when suddenly, inside our heads, it just “feels” like Christmas and when we call out, "Merry Christmas!" we really mean it. So what is that first Christmas moment, really? Is it when the tree goes up? when you switch your playlist to Chrismas music? when the kids return home to the “nest”? Is it marked by the arrival of the first Christmas card? the first batch of cookies in the oven? an annual concert? settling into It’s a Wonderful Life? finishing the gift wrapping? getting in the car to head for home? For many years, my closest friends gathered for a Saturday-morning brunch and cookie swap, it came to signify the “start” of Christmas, those special few days before and after Christmas itself, the ones where we gather near, holding dear. We started in a crowded kitchen with tall glasses of cranberry bubbly, then moved to the dining room for a relaxed breakfast, reveling in real conversation. This seems to be a tradition that’s run its course so I’m in search of a new “start” to Christmas. I wonder, what shall it be? I can’t wait to discover! For a holiday brunch, I often turn to a long-time family recipe for potato blintzes, just packets of mashed potato wrapped in crepes. My mother made blintzes, my aunts made blintzes, my Canadian grandmother made blintzes, served, always, with a dollop of sour cream on the side. That cold finish to the hot potatoes? Dreamy! You can make blintzes a day or two beforehand (it takes about two hours, start to finish, not counting the oven time) and I seem to remember my mother freezing blintzes too. ALANNA’s TIPS If you peel the potatoes (I never do), add an extra potato to make up the lost volume. You could also use leftover mashed potatoes, just add the cottage cheese, onion and eggs to lighten the potato-y denseness. 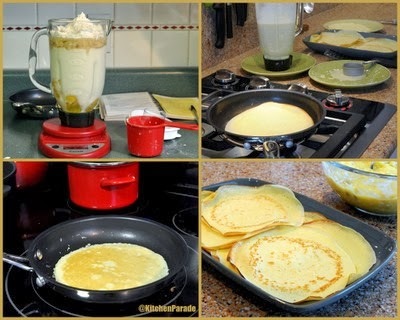 Crepes are easy to make but a few tips will help you get the hang of it faster. Don’t worry about the first one or two crepes, they usually (though not always) turn out pale and doughy and unappealing. It takes a bit to figure out exactly where to set the heat, how much batter to use in your own pan, how to gauge when the crepes are ready to turn over, etc. But don’t worry, even imperfect crepes taste great. Plus when you make the packets (aren’t they just cute?) they hide the crepe edges. Pay more attention to color on the first side since it will be the “outside” of the blintz and color is more appetizing. For more color, turn up the heat a bit, though not so much for the edges to become dry and crinkly. If you have more than one skillet, it’s possible to keep two or even three skillets going at once. Every six or so crepes, put the blender container back on the machine for a whirl, this keeps the batter from getting floury near the bottom. Kitchen Parade is written by second-generation food columnist Alanna Kellogg and features fresh, seasonal dishes for every-day healthful eating and occasional indulgences. Do you have a favorite holiday recipe that other Kitchen Parade readers might like? Just send me a quick e-mail via recipes@kitchen-parade.com. How to print a Kitchen Parade recipe. Never miss a recipe! If you like this recipe, sign up for a free e-mail subscription. If you like Kitchen Parade, you're sure to like my food blog about vegetable recipes, too, A Veggie Venture. Follow Kitchen Parade on Facebook! POTATO FILLING Cut the potatoes into 1-inch slices and rinse under running water. Cover with cold water plus an inch, bring to a boil and let cook until soft. Set aside about 1 – 2 cups hot cooking liquid. Drain and return the potatoes to the hot pan to cook off excess liquid. Mash the potatoes with about 1 cup cooking water, salt to taste, then add more water as needed for soft, smooth mashed potatoes. Let the potatoes cool a bit. Whisk together the cottage cheese, onion and eggs, stir this into the potato mixture. 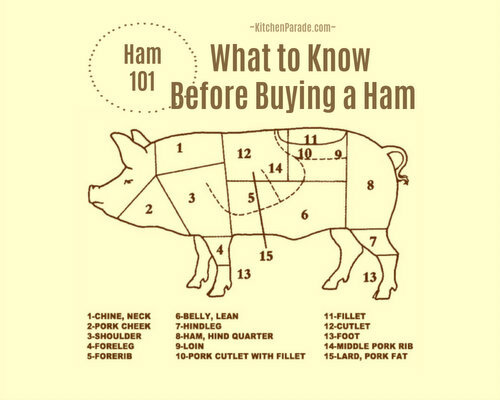 Taste and adjust the seasoning, make sure it tastes good! Set aside while making the crepes. MIX CREPE BATTER Mix all the ingredients in a blender. REST Let Crepe Batter rest at room temperature for 45 minutes (more is fine too, even up to a couple of hours) before cooking the crepes, give the blender a last whirl before beginning to make the crepes. Don’t skip this step, it makes all the difference! MAKE CREPES Heat a small non-stick skillet on medium high, brush it lightly with oil, then wipe the pan with a tissue to leave just a bare film. You won’t need to oil the pan again. Pour a scant quarter-cup batter into the skillet, swirling to cover the bottom, it should sizzle a bit. Let the crepe cook until the edges begin to brown a bit and “air bubbles” pop in the center, just a minute or two, then turn over with a spatula and cook just for 30 seconds or so. Set aside to cool, stacking the crepes as they’re done. FILL THE CREPES Put a crepe on a work surface, the “first side cooked” down (it usually has more color). Add a dollop of Potato Filling in the center, then fold over the two sides, then the top and the bottom to form a neat package. Place in an oven-safe baking dish, it’s fine stack two or three layers deep. Finish with the remaining crepes. BAKE Heat oven to 350F(175C). 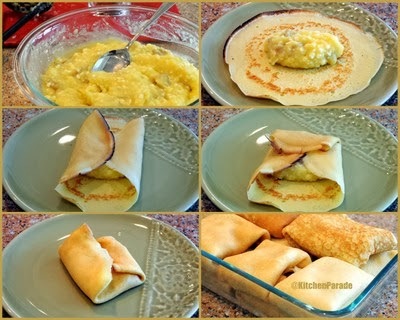 Cover crepes with foil and bake until sizzling hot, about 45 minutes. MAKE-AHEAD TIPS Wrap the baking dish in foil and refrigerate for one to two days. Let come to room temperature for one to two hours, then bake at 350F(175F) for an hour. TO SERVE Serve with sour cream. NUTRITION INFORMATION Per Blintz without/with a half tablespoon sour cream: 117/130 Calories; 4/5g Tot Fat; 1/2g Sat Fat; 59/161mg Cholesterol; 158/161mg Sodium; 14g Carb; 1g Fiber; 2g Sugar; 5g Protein. 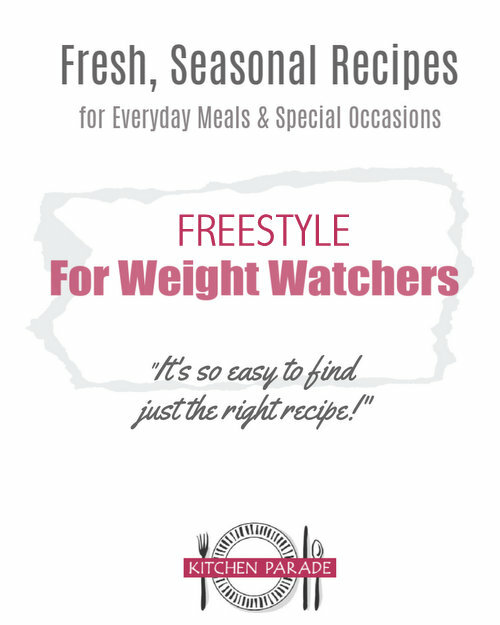 WEIGHT WATCHERS POINTS WW Old Points 2.5/3, WW PointsPlus 3 NUTRITION NOTE One reason why our Potato Blintzes are relatively low in calories is because the richness/flavor in the potatoes comes from low-fat, high-protein cottage cheese and eggs. If you mash your potatoes with cream and butter first, well, as they say, “results may vary at home”. Adapted from my Canadian family’s recipe that’s been passed down to at least three generations. Upper left - Mix the Crepe Batter in a blender. If you have a scale, weigh the ingredients, no need for measuring cups! Upper right - Set up an assembly line to make the crepes: the skillet, the Crepe Batter, a plate for the measuring cup, a plate for the finished crepes. Lower left - Cook the crepes until they're golden in color. Lower right - Stack the crepes as they're finished, they won't stick together. Upper left - Make the Potato Filling, mashed potatoes with onion, cottage cheese and eggs. Upper right - Now it's time to fill the crepes to make blintzes. Think "pillows" or "packets" and they'll come together in no time! First place a crepe on a work surface, dollop some Potato Filling in the center. Center left - Then fold the left and right sides of the crepe over the filling. Center right - And then fold the top over. Lower left - And then the bottom. See what a neat little pillow you've made?! Lower right - Collect the blintzes in an oven-safe dish, it's okay to stack the blintzes, they don't stick together. Alanna - brilliant! I'm always looking for something a little different (and not sweet!) to bring for our family's Christmas brunch - thanks so much for sharing your family's tradition. I wish you and your the merriest of Christmases. Will you STOP (sending recipes I am anxious to try)? This might work for our Christmas Eve Brunch-at-Dinner Time along with fruit and the Cranberry cake for dessert. How about adding bacon? Love your columns! So I took the leap and tried new recipes for our Christmas Eve brunch-at-dinner. The potato blintzes were a real hit, though I had to tweak a little to make it come out right. They started out too watery, so I added some leftover mashed potatoes, and a little more seasoning. Then decided to sprinkle a little grated Colby-Jack in each one. I know you approve of that sort of thing. In all of my 46 years of good (so I'm told) cooking, I had never made a crepe and what fun it was! I'm on the way now to making many more, as we sat around the table and discussed what else could go in them: chives, more cheese, fruit? I've been scared to try crepes since I don't have the right skillet for them, but I love your process photos--they make it look very do-able for me.